DHCP (Dynamic Host Configuration Protocol) is the protocol used by network devices (such as PCs, network printers, etc) to automatically obtain correct network parameters so they can access network and Internet resources such as IP Address, Default Gateway, Domain Name, DNS Servers and more. The router will act as a DHCP server for the 192.168.1.0/24 network. IP Addresses already assigned to our switch (192.168.1.2) and File Server (192.168.1.5) will be excluded from the DHCP pool, to ensure they are not given out to other hosts and cause an IP address conflict. First step is to enable the DHCP service on our router, which by default is enabled. This tells the router to issue IP addresses for the network 192.168.1.0, which translates to the range 192.168.1.1 - 192.168.1.254. We will have to exclude the IP addresses we want later on. The 'domain-name' and 'lease' parameters are not essential and can be left out. By default, the lease time for an IP address is one day. This excludes IP addresses 192.168.1.1 - 192.168.1.5 & 192.168.1.10. As you can see, there's an option to exclude a range of IP addresses or a specific address. 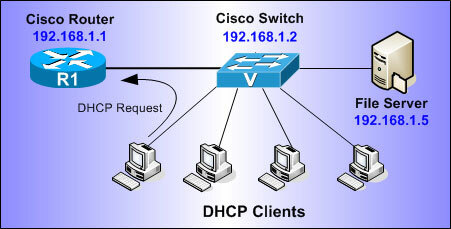 The above configuration is all you need to get the DHCP server running for your network. We'll provide a few more commands you can use to troubleshoot and ensure it's working correctly.